Bull trout were historically found in approximately 60% of the Columbia Basin. Today their population is highly diminished and fragmented, and found in less then half their historic range. Scattered populations exist in Oregon, Washington, Idaho, Montana and Nevada. The United States Fish & Wildlife Service listed the species as threatened under the Endangered Species Act in 1999. Bull trout populations have declined and certain local populations have been extirpated due to a series of human-related causes, including road building and logging, mining, grazing, construction of dams, urban development and the introduction of non-native fish species. Bull trout need the coldest, cleanest water of the salmonids. The presence of adequate bull trout populations in a stream or drainage is a strong indicator of watershed integrity. Along with water temperatures below 59 Fahrenheit and very little fine sediment in a waterway, bull trout rely on a complex system of streams with riparian vegetation, bank stability, deep pools, shade and woody debris to survive. 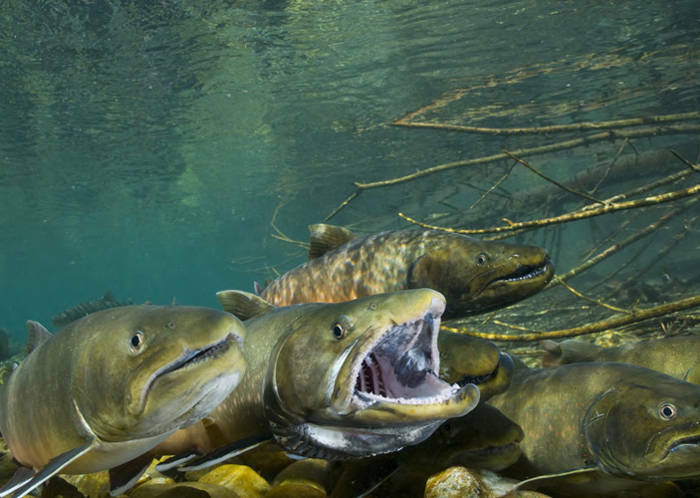 Bull trout resiliency depends on a system of connected watersheds to allow for proper migration from spawning streams to larger rivers and lakes. The entire Clearwater River drainage is bull trout habitat, particularly the headwaters of all its major tributaries, as well as the St. Joe River and the Salmon River. The most productive habitat for bull trout is in the Upper North Fork Roadless Area. The battle to recover bull trout populations is far from over. Seventeen years after the listing of the species under the Endangered Species Act, the US Fish & Wildlife Service has yet to complete a recovery plan, which is required by law. Draft recovery plans for the species were started in 2002. These plans provide a road map to recovery by identifying actions needed to address threats in each core watershed. Each recovery plan must identify site-specific actions that may be necessary for the conservation and survival of the species, objective, measurable criteria which, when met, would result in the species delisting, as well as estimates of the time and cost required to achieve the plan’s goals. A lawsuit was filed in 2016 by the Alliance for the Wild Rockies (AWR) and Friends of the Wild Swan seeking an adequate recovery plan for the species. Clean water with very little fine sediment in the stream bottom. Fine sediment fills up the spaces in the spawning gravel, restricts oxygen flow and smothers bull trout eggs. Cold water temperatures are very important for bull trout. If water temperatures rise above 59 degrees F then it creates a thermal barrier that restricts migration and use of available habitats. Complex streams with intact riparian vegetation to provide shade, woody debris, bank stability and deep pools. Connected watersheds allow the fish to migrate. Bull trout spawn and rear in stream habitats. At about two years of age they migrate from their spawning stream and mature in lakes or rivers, traveling up to 150 miles. They return to their natal stream to spawn but unlike salmon make the journey between stream and lake many times in their life. Comprehensive protection and restoration of bull trout habitat must done be throughout the range of this native fish. Failures in road management place Bull trout at risk – November 2017. Consultation resumes to ensure dams don’t harm Bull trout - February 2017. Airstrip expansion in Selway-Bitterroot Wilderness threatens Bull trout – August 2014. Learn more about Bull trout.